I can remember when Dnsstuff.com was a free service. It was a great utility for webmasters, network admins, and many others. When the service switched over to a paid service a lot of people had issues finding a good free alternative. In the past years I have just been using NSLOOKUP or IPtools.com and doing most of the work manually. Well I stumbled apon DNScog.com today and just had to write about it so anyone out there looking for a dnsstuff.com alternative. DNS Cog ran a bunch of extensive tests against the domains I tested with. It identified some things I had overlooked with a couple of domains are I am in love already. Looks like DNSCog is temporarily down for now. I did however find a pretty decent replacement for now. Check out dnscheck.pingdom.com which is operated by the well know monitoring service Pingdom. There is also a pretty slick page load analysis tool that gives you a good idea of why your website might be loading slowly. Definitely worth checking out. I have been running Microsoft Security Essentials since it was released in September '09. It worked pretty well for a free antivirus and I have other security measures in place to prevent malware. In the last year after a couple of MSE updates I noticed that the CPU usage on my laptop was high. After troubleshooting the problem for a while the quickest thing to aleviate the problem was to turn off Realtime scanning. This of course is not a acceptable long term fix. After digging around on the net for quite some time I finally found the information that allowed me to keep real-time protection on and also have a usable laptop again. After making these changes my CPU utilization went from around 60-70% down to 3% when idle. Let me start off by explaining that I have been a huge OpenDNS advocate for the last couple of years. It wasn't until recently that I started to seek out an alternative to OpenDNS. There are a couple areas that I think OpenDNS excels in currently. The problem I ran into recently is with OpenDNS' subscription model. I understand that it costs money to run a business and that OpenDNS is not a charity. I do not feel that OpenDNS is doing anything wrong, I just believe that it's time for me to find a new service. When I talked to sales over at OpenDNS about using their enterprise solution for the company I work for they said that they wanted $8000 a year. That quote was with a lot of features stripped out (specifically web content filtering). This might not sound that bad to some bigger companies but that will not fly for us. I know OpenDNS offers a free service but this free service doesn't offer malware protection. Now I know a lot of people might not think that a DNS based malware protection solution works very well but when we initially implemented OpenDNS (back when it was totally free) we saw about an 60% decline in malware infections. So you can imagine that now that the service is not offered for free and malware infections on the rise I have been looking for a replacement. I believe that I found a replacement for reliable, secure recursive DNS service. I don't care about the web content filtering function of OpenDNS and if you are looking for that maybe you should stick with OpenDNS but we have money invested in a more in depth solution. I have been testing DNS Advantage at home for the last couple of weeks and it has been great. Its fast (not as fast as OpenDNS but we are talking a couple milliseconds), and in the tests I performed it stopped me from going to malware ridden sites. On the back end the DNS infrastructure is run by UltraDNS and if you are not already aware they are a leading in Managed DNS services. If you are looking for a recursive DNS service that offers security features I would highly recommend DNS Advantage. I did not write this article to bash OpenDNS, as I said for years I was a OpenDNS advocate but we have gone our separate ways and I want to pass the information that I learned along to you. If you would like to try DNS Advantage please replace your current resolvers with the following. If you manage any Server 2008 Core or Hyper-V Server 2008 servers chances are you have had the need, or at least wondered how to uninstall programs without the GUI. Well I ran into a situation where our antivirus did not install properly and was causing some issues on one of our Hyper-V hosts. So after some digging I found the answer, and I'm going to share it with you. First make sure remote registry service on the hyper-v/Server core server is running. This is needed because the uninstall information is stored in the registry. Next copy the value of the UninstallString and paste that into a command prompt on the Hyper-v/Server Core and this command will uninstall the program associated with the GUID. Full drive encryption that runs under Windows 7. When I was running Windows 7 Ultimate RC I used BitLocker. It was great. It did everything it advertised, and everything I wanted. Now that Windows 7 is coming out and I have to start using a legitimate copy of Windows 7 I decided to go with Window 7 Pro. 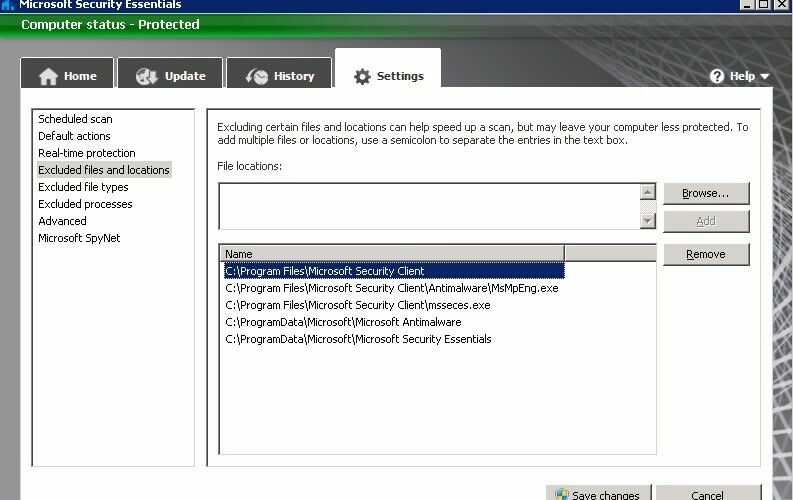 Windows 7 Pro dosen't offer Bitlocker in any version other than Enterprise, or Ultimate. If you don't want to spend the money on Ultimate or you buy a PC that already comes with a version of Windows 7 other than Ultimate TrueCrypt is for you. strong Features: Creates a virtual encrypted disk within a file and mounts it as a real disk. Encrypts an entire partition or storage device such as USB flash drive or hard drive. Encrypts a partition or drive where Windows is installed (pre-boot authentication). Encryption is automatic, real-time (on-the-fly) and transparent. Parallelization and pipelining allow data to be read and written as fast as if the drive was not encrypted. Provides plausible deniability, in case an adversary forces you to reveal the password: Hidden volume (steganography) and hidden operating system. I recently ran into a snag installing SP2 for Windows Server 2008. The message I was getting was that SP1 needed to be installed first, even though SP1 was installed. The reason for this is that I was missing a update. A prerequisite for SP2 which didn't show up in windows updates. The update is KB955430 . After installing this update I was able to install Server 2008 SP2. I was given an "Access is Denied" response. Most of the forum posts, and other blog entries about this direct you to make sure you are using an explicitly assigned local administrator of the server. The difference here is that this DHCP server was a domain controller and the user account that I was trying to run the netsh command as was a Domain Admin, domain Builtin\administrators groups. Thankfully I found the promise land! A Microsoft Support KB article explaining a slightly different way of using netsh to "dump" instead of "export" configuration and Lease information. Now open the txt file in notepad and do a find/replace of the old DHCP server IP address for the new DHCP server IP address. And finally run the following command to check for inconsistencies. At this point if you havent already Authorized your new DHCP server you will need to do this for it to start responding to requests. Open the DHCP administration console, right click on the server name, and click Authorize. I ran into this issue this morning where none of our users could log into the Communicator Web Access service. After looking around at configuration and running debug logging I found a problem with one of the Certificates. In an effort to better understand the error I did a little looking around and it appears this error is almost always caused by a certificate issue. A certificate issue between the CWA (IIS Web Server) and the OCS front ends. There are 3 places to check for certificate problems. If you open up the CWA console, right click the server name and click properties. If there is a problem with your certificate you should get a pop up explaining why. There is a select certificate button that you can use to select a different certificate if there is an issue with the previous. The second place to look is still in the CWA console but right click on the CWA object below the server name and click properties. Under the connectivity tab should be the certificate that the end users will use to establish a connection to the CWA web interface. The last place to check that the correct certificates are being used is within the IIS Manager. Expand Server Name, then Sites, then click on the CWA site object. In the actions pane on the right hand side click on bindings, and check that the correct certificate is set for the SSL Binding. After I replaced an expired certificate and rebooted the server CWA worked like a champ. I ran into an issue with a server I was loading Windows Server 2008 R2 x64 on where after installing a couple rounds of patches I could not add any server roles through the Server Manager. The error that I found was "HRESULT:0x800B0100". I luckily stumbled upon a technet blog that helped me fix the issue. I had to assume one thing because the blog writer left a detail out. They have you download the Windows Update Readiness tool. When you run the tool it just looks like a hotfix is being installed. So just keep in mind that this process is actually running the readiness tool and you can proceed to finding the log file and finding the corrupted update catalog that is causing the issue. The only fix that I have seen work in this case is to MANUALLY map the printer on the host machine. First you have to create a new TCP-IP Port on the machine that points to the IP of the printer. Then you add the printer, using that port, and using the most current driver from the HP site for your printer. After that is done, I can only surmise that the host-based driver you installed, now that it actually resides on the host of the document that wants to be printed, can now send documents to the printer and print normally. NINJA EDIT: This issue can also be resolved by tweaking spooler settings on the server side driver, by making documents print directly to the printer INSTEAD of spooling. This does work intermittently, but can be used to solve this issue.